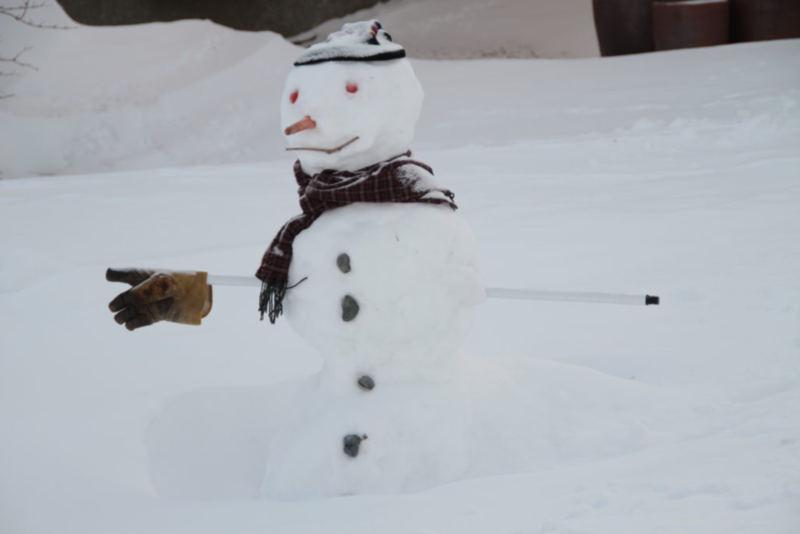 Yes, life-lessons can be learned from a snowman—when followed by a winter storm. It’s only a stupid snowman! Not so fast. Yes, it’s a snowman. I was wrong too, thinking it to be silly and mundane. Dismissing it as child’s play—as unimportant—as frivolous. It’s neither silly, stupid, nor infantile. On a balmy December 4th, 2016, with temperatures around zero, we built a snowman—my daughter, grandson and I. It was a real ‘kumbaya-day.’ A quick job. The snow was perfect—sticky and light. However, it did take some pleading at first to get me outside. I was reluctant to joint them since I was “busy.” I’m always busy (apparently.) At that point there wasn’t an abundance of white powder—barely two inches of snow—patches of green grass was still visible. 1 | The purest and deepest joy to be experienced is usually found in the familiar, the basic and elementary things we do (together.) Happiness (as we know, but seldom believe) is found in unlikely places. The entire exercise didn’t last more than 30 minutes, we didn’t have to travel, neither spent a dime—only stepped out the front door. 2 | You have to make time, set aside time for important things to take place. Learn to prioritize. You have to plan. But don’t overthink it. If you don’t—prepare yourself to miss out on grand experiences. 3 | Learn to grasp opportunities. Develop a discerning eye. I’m not talking about egotistical benefitting of self—this is about seeing an opportunity that can lift other people’s souls. Develop an attitude of, what can I do to help others? How can I make life better and more enjoyable and more purposeful for others? Funny thing—in the end, we grow in the process and reap the satisfaction of experiencing the joy it brings in their lives. I’m not talking about expensive gifts. That same day I thought I’d quickly pull someone’s car out of the snow in a parking lot with my 4×4. Alas, I got stuck myself. Another humbling w=experience. More good Samaritans jumped in, got me out, then we pushed the first stuck vehicle out. The Sunday we built the snowman was a perfect day. It was easy to romanticize and become lyrical about turning challenges into opportunities. Which is what I did—I posted on twitter and Facebook—singing the joys of a mild and wonderful winter. The next day a winter storm hit us. Over the next three days, Manitoba plummeted into the ice-age. I soon swallowed many of my lyrical words about the joy of snow. On Sunday we all sang, “Kumbaya,’ and ‘let it snow, let it snow, let it snow.’ By Wednesday we pleaded and prayed for a reprieve—for the snow to stop. The snowplows worked around the clock. Most of us shoveled several times every day, moving tons of snow by hand, snow blower and plough. 5 | Learn to discern the genuine from the fakers. Not all snowmen are “real.” Some are made out of plastic, are inflatable and can be plugged into a wall-socket, lighting up like a Christmas tree. People are very good fakers. 6 | It is okay not to be too politically correct. In this day and age of the persistent call for diversity in the arts, will we be allowed to continue using the word snowman? Or should we refer to a snowwoman? Or perhaps, gasp, a snow person? Please people—let’s not lose our minds and common sense. Repeat after me: it’s a snowman. It’s that simple. 7 | Don’t be afraid to stand out. Do what is right. (Even if you are the only one doing it.) No one else down the long, long street we live in, half of them with children living there, built a snowman. Why? Now it’s minus 22—unpleasant to be outside, never mind built a snowman. I went to check up on our snowman this morning. He suffers from frostbite—lost the sensation in his left hand. But he’s standing! Today, he was only up to his thighs in snow. Next time you have an opportunity to build a snowman—do so. It’s not silly, childish or stupid.